Hiya Readers! I have nail polish swatches for you today. These mini sets were sent for me from the Born Pretty Store. You all know now how much I love mini polishes, and these colors really captured me. I have to admitted I was hesitant at first, but let me tell you they're actually better looking in person. 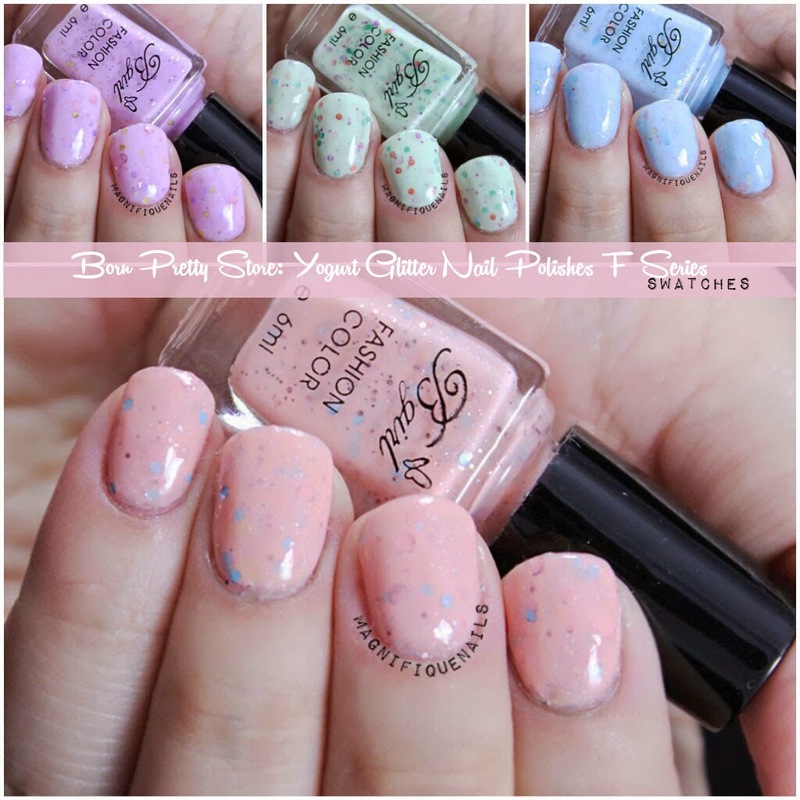 These mini sets contain four different pastel shades. The amount of glitter in each polish were enough to cover the nail completely. I was very satisfied, since it is very difficult at times to get the right amount of glitters on the nails. The formula on each polish were a little thick, I suggest to add a small amount of nail polish thinner before hand. Sparkle Yogurt Pink: This is my favorite color by far. 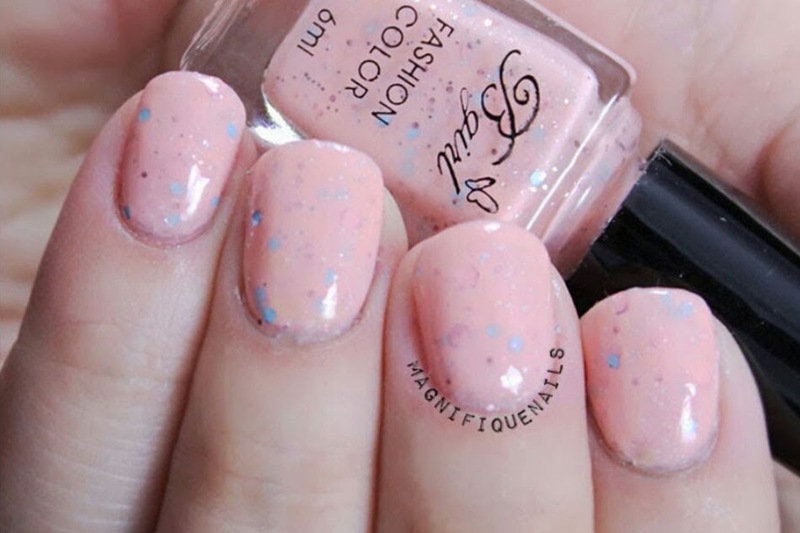 It's a peachy pink creme with medium pink/blue hex glitter with sliver micro glitters. The color is a little darker than the photo, but it looks amazing! This is two coats, sealed with top coat. Sparkle Yogurt Green: This is a minty green creme with medium red/blue/green/purple hex glitter & sliver micro glitter. The color is a little darker than the photo. This is two coats, sealed with top coat. Sparkle Yogurt Purple: My second favorite. The color looks more of a lilac creme with medium pink/small gold and purple hex glitter and sliver micro glitters. The photo shown is true to its color. This is two coats, sealed with top coat. Sparkle Yogurt Blue: Blue is my favorite color and I have to say I was pretty pleased with this one. The color looks more of a baby blue with medium pink/small sliver/blue hex glitters with sliver micro glitters. The photo shown is true to it's color. This is two coats, sealed with top coat. These minis sets are $7.99 (click here), which is not bad once you try out these beauties for yourself. Especially if you haven't tried any indie or glitter polishes, this would be a great start to give them a go because they're really affordable! You can get 10% off your Born Pretty Store order with the code: ADBQ10. They offer free shipping worldwide.